At some point in the past month, Novare Res created a new challenge for those of us who bested the list of 200 beers to try. Now, in addition to having a personalized, engraved chalice (as well as the envy of beer needs far and wide), each member of the Uprising gets access to a special new car. This VIP club, as it is known, features a list with 100 blank spaces, to be filled in by bottles and occasional draft pours of some of the rarest and finest beers Novare has on offer. In fact, there is a special bottle list that only VIP club members have access to. There is no prize for complete the card, but really, isn’t the additional beer education reward enough? Also, there is no cost to join! Once you’ve finished the Uprising challenge, all you do is have to ask to join the VIP club. Right now, the VIP club is only being advertised via word-of-mouth but I figured I should give it a bit of an endorsement with a blog post (I hope there aren’t Fight Club style rules about it). I joined the club this past Sunday, after learning about it from my fellow beer advocate Matt. I didn’t copy down the entire list of exclusive bottles, but I know it contained all three of the De Proef collaboration beers (with Tomme Arthur, Jason Perkins and John Mallett), the Froach 20th Anniversary beer, Black Albert and Mikkeller Cascade Single Hop IPA. In the future, more bottles will be added, and as the stock dwindles, some bottles will be removed from the list. There is also the possibility of special draft selections being part of the VIP club, but it appears the focus of the club is for Eric to share some special bottles with a group of loyal customers who mainly drink the draft list. [if you had a 20 oz chalice, wouldn’t you stick to drafts as well?] I’m excited to get back and try some more special bottles; I’ve been on the lookout for the Froach 20th Anniversary beer since I first heard of it a few months back. I don’t know the policy of splitting big bottles from the list with non-VIP members, but if you see me at Novare and want to test the rules, just let me know. I had already had a few rounds (there was a beer and chocolate pairing going on at the time of my visit), so I decided to inaugurate my card with a 12 oz seelction, the aforementioned Mikkeller Cascade. Also that day, I reviewed a few other choice beverages, including what my be my favorite Cantillon selection, the St. Lamvinus. Poured from a chilled bottle into my Uprising chalice at Novare Res. It has an opaque, dark orange appearance. There is a thin white head. There is no visible carbonation, but it is a dark beer, so any rising bubbles may be hidden from view. The aroma is surprising. I can smell sweet malts and some fruity hops. They work very well together. It has a crisp, dry bitter flavor. It’s very hoppy! It starts out bitter, then bitter flavors return anew in the finish. Not surprisingly, there is a bitter aftertaste as well. It actually tastes slightly creamy at first. It has a world class level of flavor. It has a lighter medium body. It’s hard to tell if the tickle I feel on my tongue is due to the carbonation or the bitter hops. It feels good either way. I find it to be very drinkable for a bitter beer. I wouldn’t want an entire 4/6 pack, but I could easily finish this bottle. With just these 12 ounces, I won’t get tired of the bitter hops. Reviewed from my notes. Hand pumped from a cask at Novare Res. The beer is a deep purple color with a soapy tan head. I am watching the head dissolve in front of me. There is some rising carbonation. It has a great cask beer look. I am not picking up much in the way of an aroma, just some slight woodsy notes. I can detect flavors of rye, plum, whiskey and a bite of alcohol. There may be some juniper in the mix as well. It’s a very complex beer. It has a medium body and not a very significant mouth coat. As for carbonation…let’s say if a beer with a lot of carbonation was like a huge mountain range, the Mols Øl is like some rolling hills; it’s not a flat beer, but it isn’t that difficult stomach [I’m not sure that analogy makes much sense now, but when I wrote it in my notebook I thought it was a good comparison]. This beer is not exactly what I was expecting from a Danish casked beer. The spices and complexity makes it hard to drink fast–I want to give each sip a lot of attention–yes it is still pretty drinkable. Reviewed from my notes. Review based upon two 4 ounce pours I had, each served in a tiny wine glass at Novare Res’ Valentines Day beer and chocolate pairing. The beer has an opaque plum/cranberry hue. There is no head or visible carbonation. It is a beautiful looking beer. It has a great fruity, funky aroma. It is slightly champagne-like. A mildly sweet fruit flavor is the first thing I taste. Tartness kicks in as I swallow and lingers briefly. I am definitely tasting wine-like flavors (red grapes, mostly), but all in a great funk wrapper. It’s delicious. It has a crisp, dry light body. The tingly funk feeling is a great substitute for the carbonation bubbles you can usually feel in beers. There is a slight mouth coat. For a sour beer, this is amazingly drinkable. It really isn’t all that sour. I wish I had a bigger pour! It is definitely a sipper, but extremely enjoyable. Personally, I can’t see myself ever getting tired of this beer. It is near perfect. Reviewed from my tasting notes. Served at the Old Port Sebago location in a logo glass. The beer has a translucent, tarnished orange color. There is a thin head made of white soap bubbles. I can see lots of carbonation rising within. It’s aroma is earthy and has scents of grassy hops. It is not an overpowering smell. The beer tastes like a mouthful of hops. There is sweetness, citrus and lots of bitterness. The bitter flavor stay on long after I’ve swallowed. It’s body is lighter and feels slightly watery. It does have a good mouthcoating–a fine layer of sweet and bitter flavors/feelings. The carbonation compliments the bitter flavors. I find this to be a pretty drinkable beer, especially for a bitter IPA. The bitterness may prove to be too strong after a while, but this single pint drinks very well. A solid, reliable, local IPA that is worth revisiting. Poured from a cellar temperature bottle into a Gouden Carolus chalice. It has a dark ruby/brown color, almost like a glass of cola. There is a modest tan foam head that settled down to a skim of foam. No light can penetrate through the sides of the glass, but near the top of the beer some light filters through and I can see bubbles rising to the top. The aroma can be classified and spiced malt. I am picking up nutmeg, sweet candy and a bit of juniper. It’s very interesting. It has a big roasted malt flavor. You can taste the rye a bit of the nuttiness from the chestnuts. It also has a touch of warm alcohol that lingers on, along with some forest-like flavors (probably the juniper I picked up in the nose) and finishes up with a slight coffee bitterness. I was surprised at how thick this beer was when I first tasted it. I rolls around your mouth and doesn’t want to leave once you’ve swallowed. It has the kind of body that demands respect and attention. It is hearty enough to earn the name winter warmer. Despite the big body and flavors, I find the beer to be quite drinkable. At no point do the spices overwhelm, nor does the ABV. This is an ideal beverage for a long winters night. Highly recommended! 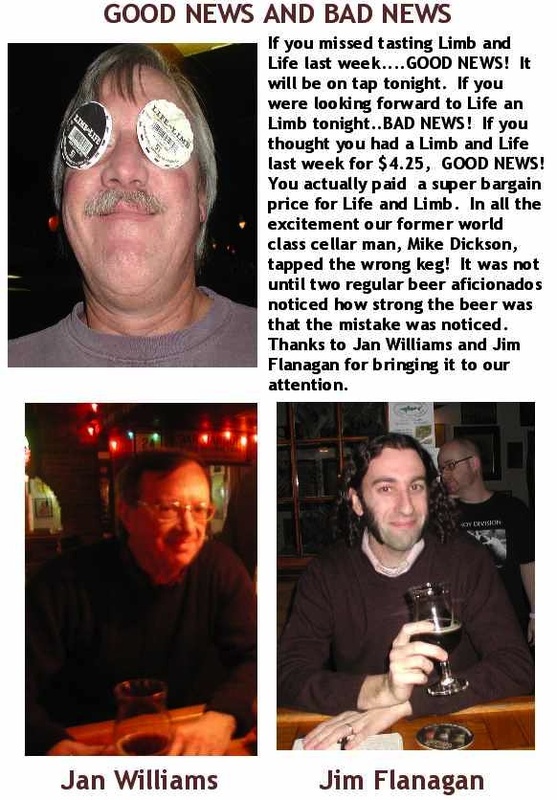 Here are the three reviews I wrote for the beers I got to try at the Novare Res event held this past weekend. Reviewed from my tasting notes. Served in my 20oz Uprising Chalice at Novare Res. It pours an incredibly dark ruby color with a thick, tan, foam head. It smells slightly sweet, with an earthiness to the aroma. There are hints of spices and maple. There is a definite sweetness up front in the taste, and it has a dry, alcoholic finish, but the sweetness remains throughout. There are spruce and maple flavors. There is also a hint of coffee bitterness. It’s a very robust flavor. It has a very full body and low carbonation. As for drinkability, it’s a pretty sweet beer–a bit too much for my tastes. Still, I consider this a good beer. I would order it again and would certainly pick up a bottle if I happened across one. Reviewed from my tasting notes. Served in my 20oz Uprising chalice at Novare Res. This excellent beer pours a peach/orange color. It is slightly cloudy. It is very interesting looking. It has a yeast aroma, along with some citrus. It is a very good fruit smell. The main flavors are of peach and grapefruit. There’s a bit of sourness to the finish. It tasted a bit chalky at first, but as I drank it, this went away. I think the beer may have been too cold at first and as it warmed, this chalkiness went away. The approach to cellar temperature really improved things. It has a medium body with no detectable carbonation or coating. It feels great. The drinkability is equally impressive. This beer has just the right amount of sourness. I’m really glad I got to have this beer! Appropriately, this beer is black like the night. There is a brown foamy head that leaves impressive lacing. There is a coffee bean bitterness to the aroma. It’s malty and robust. I summed up the taste as strong, dark, bitter, alcoholic. That seems to cover it, except for the syrupy sweetness that instantly hits you as you taste the beer. The 17.5% ABV is also very present in the taste; lots of alcohol. It leaves a sugary coating in your mouth. The body is very heavy and has low carbonation. I could only drink one of these in a sitting, and I’ll probably never order one again. It’s a strong, intimidating beer. I probably should have been better prepared for what I ordered and not made it my last beer of the night. Order this one carefully. There are still a few special beers available at Novare. If you haven’t stop by yet to try them, do so soon! It’s a beer nerd Christmas! This afternoon, Novare Res opens its doors for a very special event. They are presenting a line-up of kegs and bottles that the beer drinking public of Portland haven’t seen since…well, since Eric hosted his one year anniversary event at Novare. Most of the beers on offer are extremely rare, all will be excellent to sample. I don’t think my wallet will allow me to try as many as I’d like! Some highlights include bottle pours of Sam Adams Utopias and De Struise Earthmonk; there will also be kegs of Birra Del Borgo Duchessic Ale, Mikkeller Black and Draft Bear, Sierra Nevada/Dogfish Head Life & Limb, Smuttynose Oaked Farmhouse, and a 2006 cask of J.W. Lees Harvest Ale that has been aged in sherry barrels! I’ve been looking forward to this event since it was announced, and once the beer list was posted, it’s been nearly all I’ve thought about. The full list of beers, as well as other details, are available at the Novare Res website.